The Guelph Jr. B Regals split their two road games over the weekend and now sit second in the MidWest Division. The Regals began their first of five straight road games with a 16-9 loss in Six Nations on Friday evening. Guelph went shot-for-shot with the Rebels in the early going and finished the first 20 minutes tied 4-4. The game remained close until the 2:34 mark of the second frame. Leading 8-7, the Rebels fired off four goals in the last 2:33 of the middle period to take a 12-7 lead into the third period. From there, the Rebels would not let the Regals back into the game as they cruised to a 16-9 win (view boxscore). The victory was the Rebels’ fifth in as many games while the loss dropped Guelph to 1-2 on the season. On Sunday, the Jr. B’s headed down to Welland for a 7 PM face-off with the Generals. It had been eight years since the Regals had last tasted victory over Welland. It was a tight game for the majority of the opening frame before Reed Kurtz started a four-goal outburst for the visitors on the powerplay. Trailing 1-0 15 minutes into the game, Guelph fired off four goals in the final five minutes to head to the first intermission with a 4-1 advantage. A feisty second period saw the Regals’ Luke Kivell and Welland’s Jesse Schoeman duke it out in a spirited battle. After all was said and done, Guelph led 7-6 after 40 minutes. In the final frame, the Regals took what many assumed was a comfortable five-goal lead when they potted five goals in just 4:30, including a hat-trick for second-year player Liam Holwell, to go up 13-8. However, the eight-year curse of the Generals began to creep its way into the picture. After a timeout from the home team, Welland countered with five goals of their own to send the game to overtime. 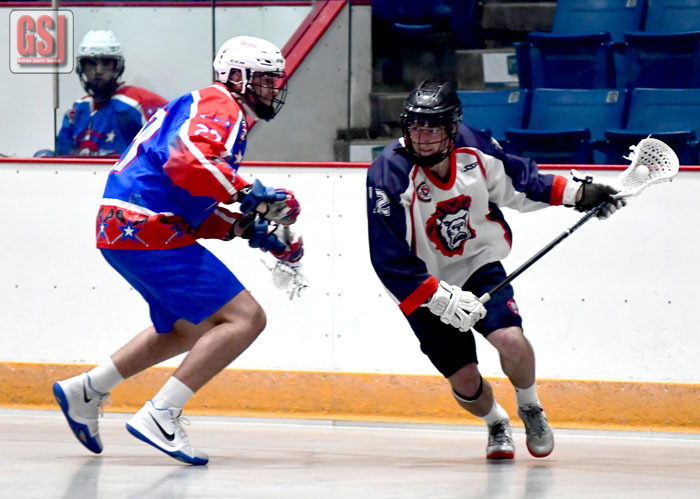 In the extra frame, Kurtz and fellow rookie Gavin Lang netted goals to give Guelph a 15-13 victory and snap the losing streak against the Generals. The win also increased the Regals’ record to 2-2 and moved them to second in the division. You can view the boxscore here. Guelph will continue its road swing in Orangeville on Tuesday before making a Far West Division visit to Point Edward and Wallaceburg on Saturday and Sunday, respectively. NIAGARA-ON-THE-LAKE – The losing streak is over. 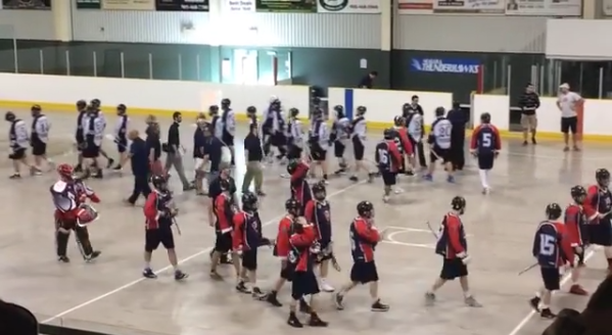 The Regals scored five times in the first 7.5 minutes of the game and ran to their first win of the Ontario Junior B Lacrosse League season Sunday afternoon, a 16-6 win over the Niagara Thunderhawks at the Meridian Credit Union Arena. The Regals, who had a long, soul-searching talk after a one-sided loss to the Elora Mohawks Friday night at the Sleeman Centre, led Niagara 5-4 at the end of the first period and 10-5 after the second. For the full story by Rob Massey, click here.